They say you shouldn’t ever tamper with a classic. And indeed some would view changing the beloved McDonald’s Big Mac as akin to putting lipstick on the Mona Lisa. After all, this beefy lily needs no gilding; with its sizzling siren call already pulling us under the Golden Arches like hoards of famished, dreamy-eyed sailors. And yet, McDonald’s have stepped boldly forward, throwing caution to the wind and thoroughly shaking up their Big Mac for the first time since its creation in 1968. As well as your regular Big Mac, Maccies customers can now get their paws on Big Mac®with bacon, which could well take the beloved drive-thru option to crispy new levels of satisfaction. But the question remains, is it still a Big Mac if there’s bacon involved? Indeed, Maccies fans have divided into two very firm camps on this issue, defining themselves as either #NotABigMac or #StillABigMac and accepting absolutely nothing in-between. I’m going to get involved. Is a Big Mac with Bacon still a Big Mac? For me, yes, just because you add an extra ingredient it doesn’t change what it is. If you added a turbo to a corsa it’s still a corsa. #stillabigmac. It’s not a Big Mac. Put lots of bacon on one change the sauce and call it the big bacon but Big Mac it is not. In other burger related news, the Grand Big Mac and Mac Jr. are making their glorious return following their initial sell-out tour of January 2018. These too can be upgraded/cause confusion with bacon. Big Mac Bacon (RRP: £3.09 – burger only) contains two all-beef patties on your three-piece sesame seed bun, special sauce, lettuce, cheese, pickles, onions. The only difference? A cheeky helping of bacon. 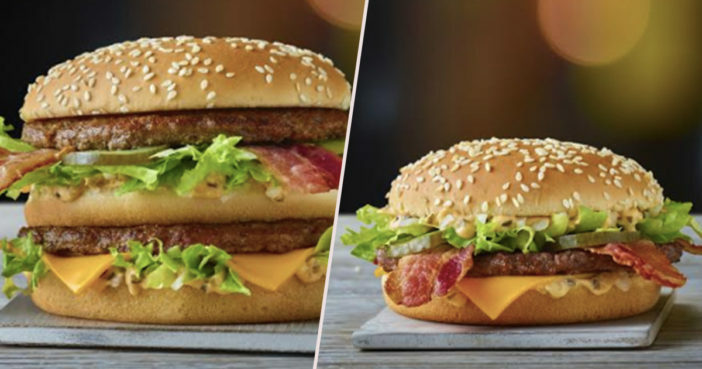 The limited-edition Mac Jr Bacon (RRP: £2.29 – burger only) contains exactly the same yummy ingredients as the Big Mac Bacon, but with one less patty. Similarly, the limited-edition Grand Big Mac Bacon (RRP: £4.09 – burger only) is a larger, meatier version of the Big Mac Bacon. The customer reaction to our Grand Big Mac and Mac Jr. last year was phenomenal, the love for the iconic Big Mac surpassed all expectations. Which is why I am delighted to introduce bacon to the Big Mac range, a twist on a classic which has sparked debates around the world – is a Big Mac still a Big Mac if you add bacon? The Big Mac Bacon, Grand Big Mac Bacon and Mac Jr. Bacon will be available in restaurants nationwide for a limited period only, up until March 19, 2019.